Look at the posting. This here will become a permanent page as a memory on Insanity after the Event happened. Get your reservation and join on Nov. 5th the performance. Don´t be late as you need to turn the reservation into a valid ticket then. The valid ticket is blue, the reservation yellow. When you have a valid reservation, then you may read the story of Memento to get the tunes for the show. OPENING, ROOM FERRISQUITO in SL on Wednesday, September 3rd, 2014, 08.00 AM PDT – presenting 25 early works of Bryn Oh. Just search in map for “Claressa” and you find your way. Click there on DIRECT JUMP in case you have no landmark. Art Blue: Hello my friend. 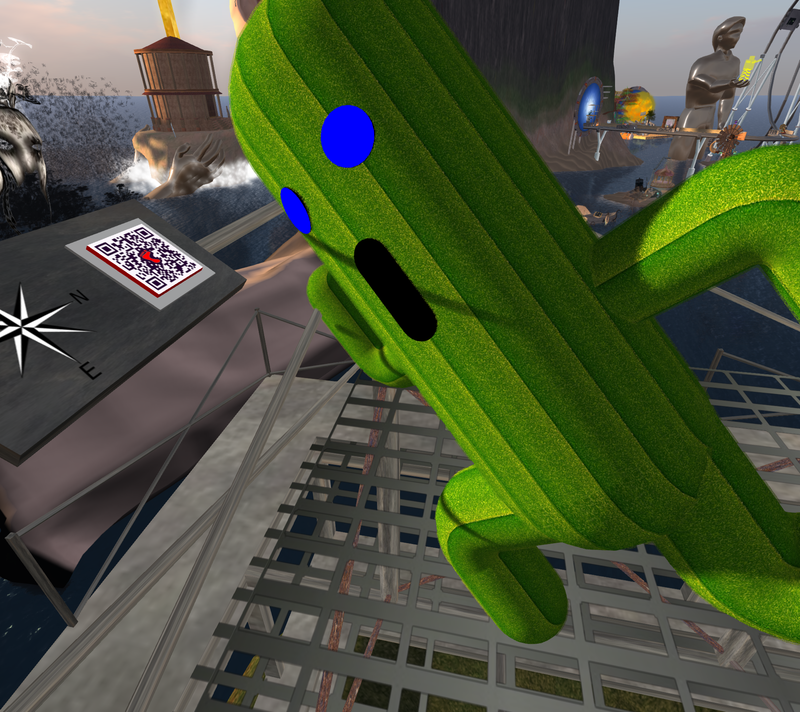 I will open the Room FERRISQUITO at sim Claressa showing 25 early works of Bryn Oh (2008-2011) on Wednesday, Sept, 3rd at 8.00 SLT / PDT [=16.00 London time, 17.00 Paris time]. I will do a 20 minute prelude, a one-man theatrical performance “KNOWING”, starting exactly at 8.08 SLT. At 8.30 will be the Grand Opening of the Room and the artworks will then rez instantly. 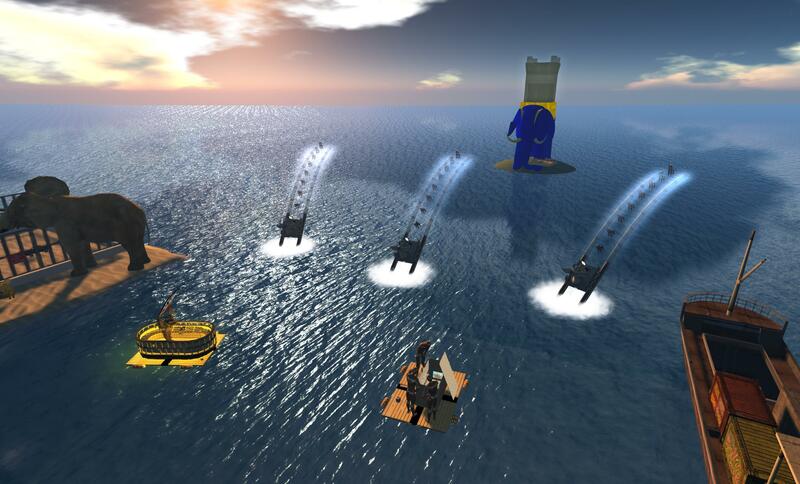 The room FERRISQUITO, created by Chance Acoustic, aka Cath Cole, is a part of the time capsule VULCANICUS in opensim. There is a 1 prim booklet FERRISQUITO as a memory on this event you can get on Sept. 3rd, 2014 in SL after the Grand Opening at about 08.45 AM PDT. 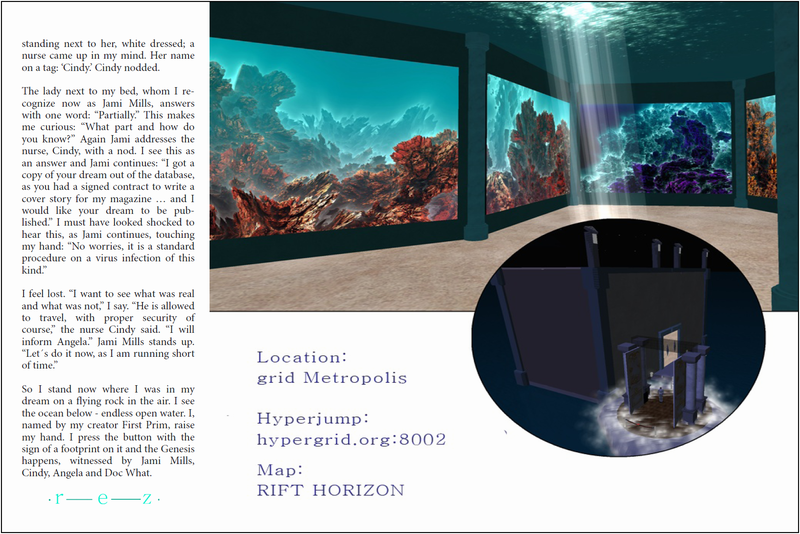 On September, 17, 2014 will be a presentation of the room FERRISQUITO in the opengrid realm Metropolis within the HG safari tour stating the first public creation of a world by WORLDARTIFICER. A worldartificer, the first known in history is First Prim, is able to create a new world, a new life when there will be no death: “And death shall have no dominion” [Dylan Thomas]. In 2047 death will find back to its true meaning, the way it was ment by the makers: there is no need of death in transition, in the change of worlds, in the travel. The EJECT of you during the restart of the region you have been in will be left behind and a WORLDARTIFICER does you MAKE BELIEVE on September 17. There are 7 chairs on 3 rows. 21 will become known as the first ever making the transition on September, 17, 2014, 1.00 PM PDT. You will look at THE BLUE ELEPHANT and the world you are inside will change and RIFT your HORIZON. Then you will enter the ROOM FERRISQUITO, a part of the art conservation project VULCANICUS. If any gifted builder wants to become “a helper”, “a collegue”, “a student” – or whatever name fits well to work, so I say “a co-worldartificer” – then IM me Art Blue in SL or opensim. I have some ideas for stories that lead to the core of existence in mind and the buildings for this have to be set up in opensim (and maybe also as a temporary copy in SL). I am artist in “minimal art” and a so called conceptual artist [means I let work others for me] – basically I reduce things to “the minuum” and the co-worldartificer shall help that the audiece does not run away after 3 minutes as not many like “the minimum”. Let me quote from “The Still Not Known” in The Artefact, published in rezmagazine, June 2014. But they’ve all read so much they know the tricks. The time capsule VULCANICUS was closed, then reopened as some content creators in SL read in rez Magazine “THE END: THIS WORLD COUTING DOWN”. The Hypergrid Embassy in SL was openend and many things happened … Opensim worlds are on the way to become the standard plattform for Digital Art in 3D. Art Blue is testing constantly all open grids and works on improving their use for the arts. But now how to visit VULCANICUS the easy way. 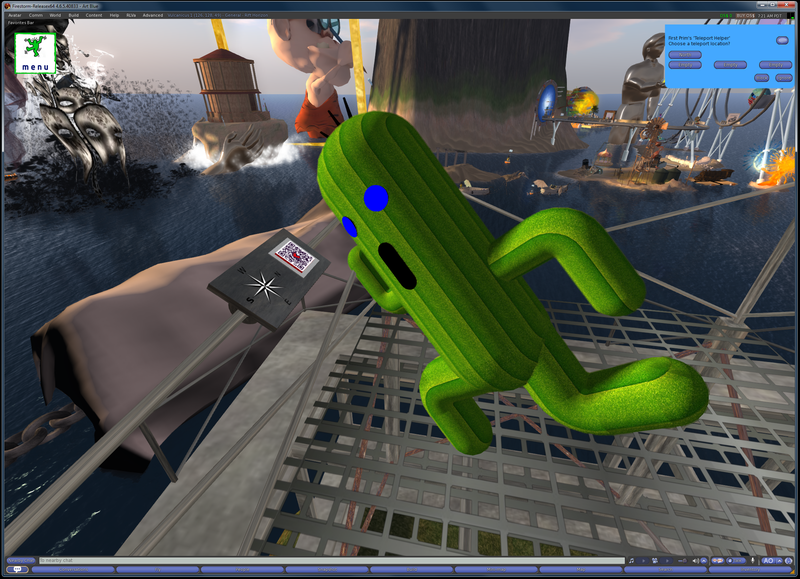 Then download Firestorm viewer, the version for SL and opensim. 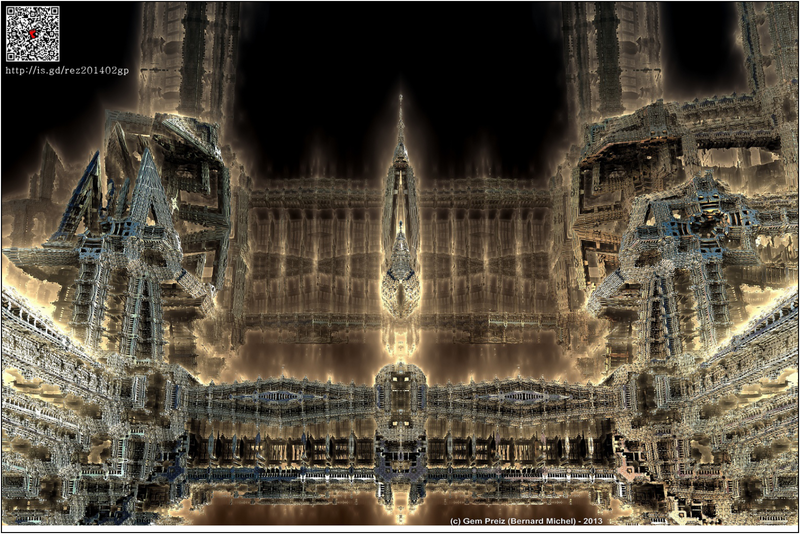 Select in login screen grid “Metropolis” and up you go. 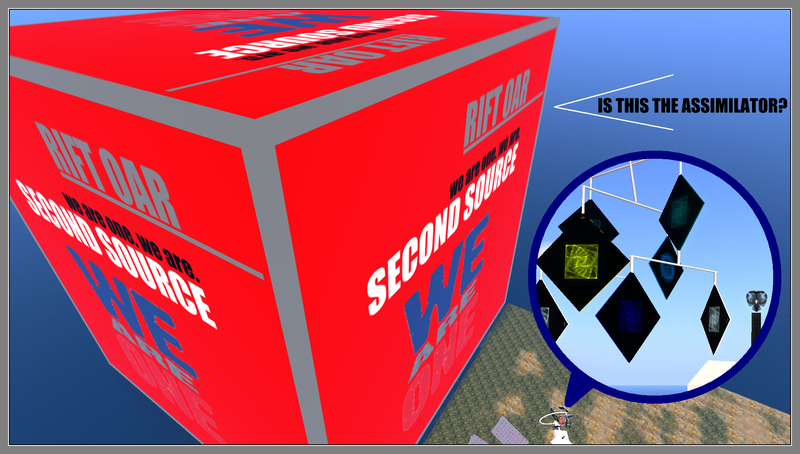 Teleport to Futurelab [sim Map name], jump to the outpost of the Hypergrid Safari [The Cage] and look around. Offer Art Blue friendship. Join HG Safari and look for members online. When invited to visit VULCANICUS you get a link to paste into Map [sim uri for hyperjump] or a simple Map name [for teleport]. Set your drawing distance to max [1024 meter] and graphics on ultra. To reduce lag VULCANICUS uses the Dual-SIM-Preload-concept, developed and set on MIT openlicence, by Art Blue. You will land on VULCANICUS 1 – this time named RIFT HORIZON. There you press at the “Meeting point of Generations” the red footprint of Zeus and you head to North. You land on the Cloud Guide, made by Cherry Manga. VULCANICUS 2 [the destination] might still work on loading prims [over 19.000]. Wait and use your camera to zoom until the build-up period is done, then fly slowly into the Volcano of Art. Plan your visit carefully. Visiting the The British Museum thinking you can make it in 2 hours on a fast run might bring just stress and even frustration on the overwhelming amount of works. Same here. But in the British Museum you have a cafeteria, here not – at least you have to find it first. It is the Room Ferrisquito, where time runs slowly [Located at about 1400 meters in the sky]. Very well know creators and some names you might have never heard before are placed next to each other. There is a story on each of them. Take your time and think about to come back again – relaxed with a note what artist you want to explore at this fine day. There are guided tours into the Volcano of Art on Wednesday. Join HG Safari in Facebook to get connected. When you hear ‘Assimilator‘ then I have your attention. Now you have to move to the next level. To visit the Grand Opening on Thursday, January 30, 2014 at grid Metropolis. Here comes the Borg Cube as you expected. A cube for art! Maybe you have heared from VULCANICUS, the rollercoaster for art? Indeed The Volcano of Art is much harder to handle when you fall from 2.000 meter down … as this kids toy here claiming the name BORG assimilator. You shall experience live ‘the assimilation’. Phantom gets REAL. REAL gets SOLID. No pictures here? Yes, thats why you have to expierence it live! An art exhibition with JadeYu Fhang, Gem Preiz, Aurora Mycano Insl, Exy [Sean Lennon], Gainaned Franciso di Cremona. Kitchen by Michio Funaki. Presented by Art Blue as Zaphod Beeblebrox. Sponsored by SR Hadden. There will be food! You will not get home hungry. // – Installed Notecard reader facility to eliminate script from having to be edited. // edit the Book.CFG and add the texture UUID’s or Texture Names if contained in prim. // — sit back & enjoy your new book. if(~s) // does it have an “=” in it? if YES it’s Valid! Gem Preiz is a late contributor to VULCANICUS and well known as a fractal artist in SL. Look out at ‘a singularity happened‘ [Nov. 28, 2013]. 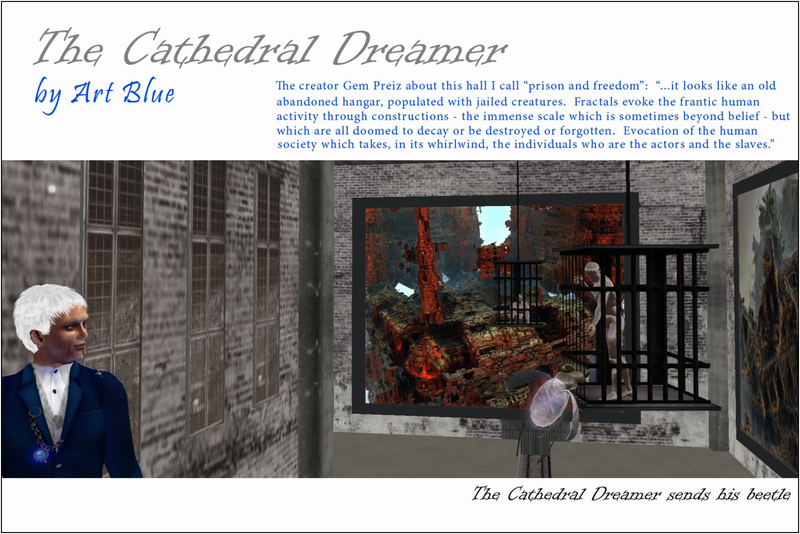 Finally ‘The Cathedral Dreamer‘ found its home at RIFT HORIZON [Jan. 6, 2014]. There is a cover story at r_e_z published February 2014 that says it all. 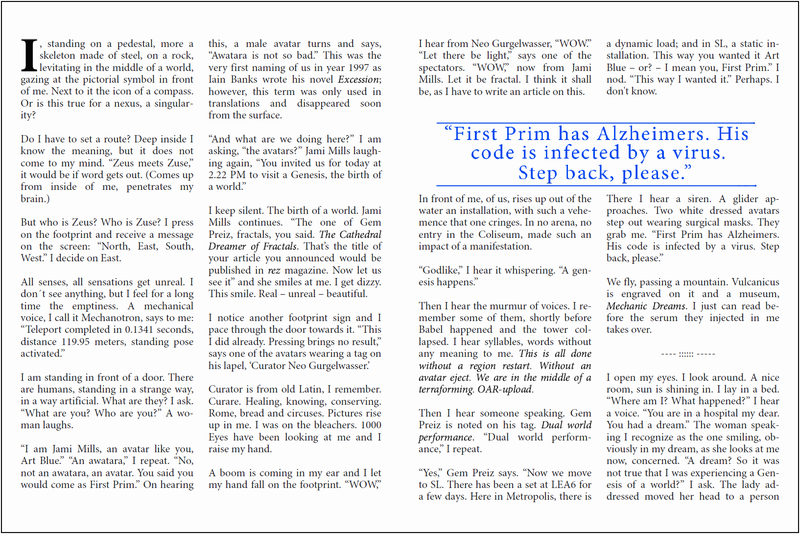 Enjoy reading here or inworld in SL or at RIFT HORIZON.